and became a violin maker. His teacher was Johannes Zach, who lived in Bohemia (which is now know as the Czech Republic). Later he worked in Budapest in the workshop of J. B. Schweitzer. His violins are world famous; some are even compared to Stradivaris. 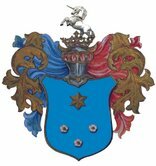 The Nemessanyi family who lived in “Szepesseg” were given a noble title by King Endre the Third on the 2nd of June in 1300 according to the “Leleszi Certificate”. with Mihaly Nemessanyi (+1694), who hid in a barrel with his companions in order to spy on the Turks. As a result of this, the Turks lost a battle in 1667. Three roses and a star can be seen on the blue crest, with a pentagon shaped crown and a unicorn placed on top. During the same time, Balint Nemessanyi (+1706) was a “kuruc” diplomat and the trustee of Imre Thokoly (he was young Thokoly’s mentor). He was the envoy for the “Felvideki” monarch in Poland and France. He accompanied Thokoly in 1891 when he was exiled by the Turks but got amnesty and returned home. In 1705 he was one of the congressmen for Saros county at the szecsenyi parliament. Andras Nemessanyi took part in the “jakobinus” conspiracy. His name is listed on the Martinovics-tree. In 1795 he was one of the defendants at the “Jakobinus conspiracy trial”, but due to his young age he was not convicted. Karoly Nemessanyi was taught by people like Ferenc Pulszky at the famous Evangelic College of Eperjes, and later he became a lawyer. From 1827 to 1828 he organised the Hungarian Youth library and the Hungarian Committee at Eperjes. Many young committee members took part or had even leading roles in the 1848 revolution. Samual Felix Nemessanyi (1837-1881) became world-renown among performing artists. L�szl� Nemess�nyi , luthier, musician. Tam�s Nemess�nyi (Kotta), marketing manager. Judit Nemess�nyi , S�ndor Vad�sz, managers. I don’t to join this webpage, as I want as many of Nemessanyis as possible to be listed here.